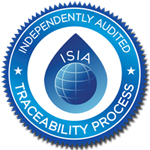 Certification demonstrates full compliance with ISIA traceability standards, following an independent audit. As an ISIA Traceability Certified company, LSP processes establish traceability through the entire supply chain, from raw material collection to processing, filtration and order fulfilment. According to the ISIA traceability program, Certificates of Origin or Analysis must reflect all origins present (if in fact a mixture of sources exists) and also reflect the percentages of each.